From his obituary: It is with great sadness that our family shares the passing of our dear husband, father, and friend, Jim Martin, after a difficult battle with lung cancer at the age of 66. 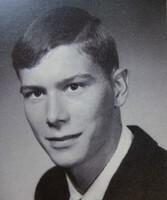 Jim graduated from Bothell High school in 1966, and earned his Bachelor’s Degree from Oregon State University in 1970. In 1976, he graduated from the OHSU Dental School and opened his own practice shortly after. Known to many friends, patients and colleagues as Dr. Martin, Jim loved his 40 years as a dentist and cared deeply for all whose lives he glimpsed and shared through his practice. Outside of work, Jim was a devoted father and loving husband to his wife and two children. He was passionate about fitness and enjoyed his almost daily workouts in the weight room and on the recumbent bike, enthusiastically pedaling to the beat of Poco or the Moody Blues on his iPod. Jim was hilarious and inspiring in his passion for culinary adventures. From (not so successful) attempts at making his own olives and vinegar, to absolutely delightful smoked chicken and “sous vide” dishes, he was never without curiosity or a new kitchen gadget. Apart from his home in Portland, his favorite place in the world was Whidbey Island, where he spent his summers as a child, and where his sister still lives. During trips to Whidbey, Jim was known to instigate twice-daily crabbing outings, and incorporate crab into every meal, often topped with his wife’s famous crab sauce. He is survived by his wife of forty years, Jane, daughter Lizzie, and son Drew. His siblings Rick Martin, and Nancy Simmons live in Arizona and Whidbey Island. He has several brothers and sisters-in law, and numerous nieces and nephews in Portland, and around the country with whom he has shared wonderful times. Before his passing, he expressed his wish for no funeral or wake, but hoped that instead those he loved and who loved him would visit and remember him in their hearts and in places of shared memories. Words fall short in expressing the depth of our family's grief, but we find solace in knowing he's digging clams, setting crab traps, doing root canals, and planting garlic bulbs in a lovely garden, wherever he may be. I sat next to Jim in 6th grade at Kenmore Elementary School. For awhile we even went steady (like for a month). Back them we wore a silly silver ring on a chain around our neck. It was a big deal for us; how grown up we felt we were! Jim dumped me for Sonja Strand. I was broken-hearted, well maybe for a week. But life goes on. I remember that when Jim went to the dentist during class time he would always bring back the almost-empty novacaine bottle. He was fascinated with those bottles and took an opened paperclip to dig out the remaining novacaine from the bottle and rub it on his hand. He offered some to me one time and I thought that was pretty cool. I always figured he would become a dentist. Ha, dreams do come true! I recall his gray-haired mother, quite tall, I seem to recall. She drove a big Cadillac with rear fins that stretched to the heavens. We were all impressed. His Dad was a contractor and they lived in a very nice home in Uplake Terrace. One day Jim brought some Indian arrow heads to school that his Dad's construction crew found when they were bulldozing a spot for a building. Again, we were all impressed. Recently I had to give a speech to a large group and I couldn't help but laugh when I thought back about poor Jim giving his book report infront of the 6th grade class. It was a pretty good report but he continued to switch his weight from one foot to the other. Finally we all, including the teacher, were so intent on his foot actions we completely forgot what he was saying. At the end. Mrs. Gates, told Jim "Nice report, Jim. But next time try to stand still while giving it." I was embarrassed for him and turned beet red. He seemed to be somewhat aloof about the whole thing. Fond memories of a wonderful brown eyed boy.